Whynot Rough Boy, starts his new with a new name of Ryder. Sheila and Mike were amazed when they came for their interview and met greyhounds up close for the first time. Family photo is Sheila, Michelle, Sarah and Mike. They wanted affectionate and didn't care about size. SO Ryder is the perfect fit for this family, he is huge and such a sweet affectionate boy. He will be loved and given lots of attention in his forever home! 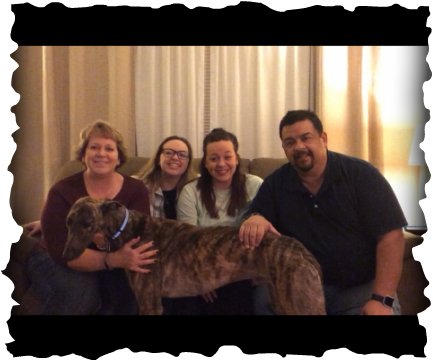 This family is already talking about adding another greyhound to their family after Ryder gets adjusted!